Like a symphony, it takes a lot of people working together to develop a standard. ISO’s role is similar to that of a conductor, while the orchestra is made up of independent technical experts nominated by our members. The experts form a technical committee that is responsible for a specific subject area. They begin the process with the development of a draft that meets a specific market need. This is then shared for commenting and further discussion. The flow-chart below details the main stages in the process. Are you involved in ISO's technical work? Tools and publications to help guide the development of standards can be found in the Resource area. Every day of the year, around eight technical meetings take place somewhere in the world. Increasingly, electronic communications are reducing development times and travel impacts. ISO does not decide when to develop a new standard, but responds to a request from industry or other stakeholders such as consumer groups. Typically, an industry sector or group communicates the need for a standard to its national member who then contacts ISO. Contact details for national members can be found in the list of members. ISO standards are developed by groups of experts from all over the world, that are part of larger groups called technical committees. These experts negotiate all aspects of the standard, including its scope, key definitions and content. Details can be found in the list of technical committees. The technical committees are made up of experts from the relevant industry, but also from consumer associations, academia, NGOs and government. Read more about who develops ISO standards. 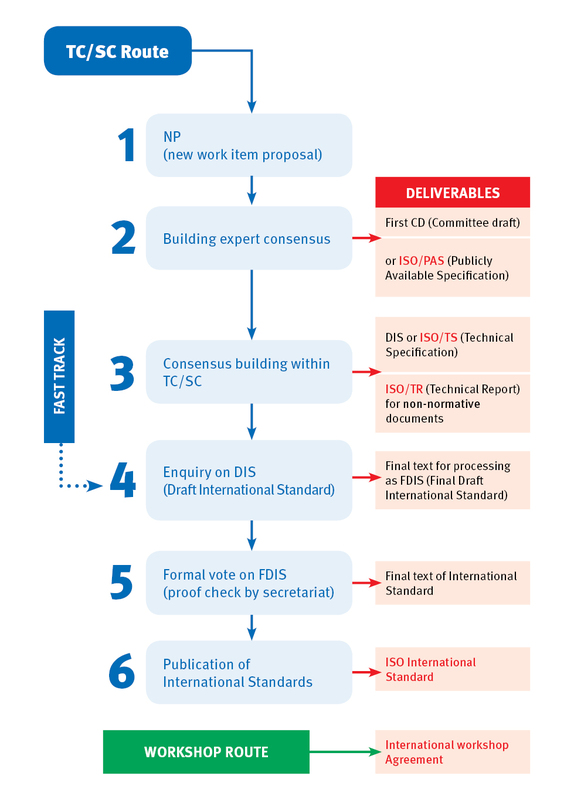 Developing ISO standards is a consensus-based approach and comments from all stakeholders are taken into account. Do you want to get involved in standards development? ISO standards have always been created by the people who use them. Whether you’re a consumer or in business you can be part of the next generation of standards. It can help give you early access to information that could shape the market in the future, give your company a voice in the development of standards and help to keep market access open. Find out more about getting involved in standards development.